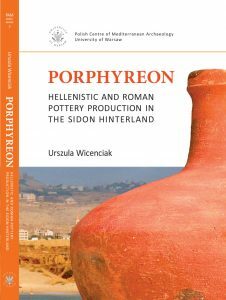 The pottery workshop in the town of Porphyreon on the Phoenician coast (modern Jiyeh in Lebanon), a site midway between Beirut and Sidon (modern Saida), operated on a local scale, producing mainly amphorae and kitchen vessels. It was an important cog in the wheels of the region’s economy from the middle of the 2nd century BC to the 7th century AD. A Polish–Lebanese rescue project in 2004 probed a Hellenistic and Roman pottery production zone in the town. The assemblage of ceramic vessels and wasters that was recorded supported an extensive study of the local repertory of vessels produced, as well as the clay of which the were made. Porphyreon, thus, became the second, after Berytus, Hellenistic and Roman pottery production site to be excavated on the Lebanese coast, whereas laboratory analyses of the chemical composition of the clay have supplied a key criterion for distinguishing locally made vessels from other ceramic production in Phoenicia. A formal examination of the ceramic material, combined with a review of ancient sources, written and other, sheds light on the administrative status of the settlement in the Hellenistic and Roman periods, placing it convin¬cingly in the hinterland of Sidon rather than Berytus. Moreover, it has added a unique small-town perspective to the study of the economy of ancient Phoenicia, based so far chiefly on data from the large urban centres like Sidon, Tyre and Berytus.